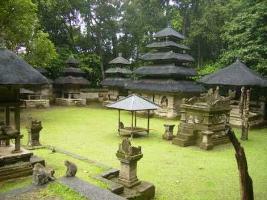 Home » Bali Temples » Alas Kedaton Temple: "Historical Site Bali Holy Monkey Forest Temple"
Alas Kedaton temple also often called Pura Dalem Khayangan Kedaton is one of the hindu sacred temple which existed in the middle of tropical rain forest. With the jungle area about 6.5 hectares and inhabited by hundreds of monkeys (bali's native primates), and this sanctuary is located right in Kukuh village, Marga sub-district, Tabanan regency. Alas Kedaton comes from uric word "Alas" means Forest / Jungle and "Kedaton" means "Kingdom", so literally Alas Kedaton means: "Kingdom's Forest", mileage to get here about 18 Kilometers from Denpasar city (Northwest direction), while from Kediri town about 7 Kilometer (northeast side of Tabanan). Monkey forest temple Alas Kedaton is indeed a sacred place that purposely built in an area which can give inner stillness and far away from worldly materialistic life. According to archaeological research, this holy shrine is classified into the ancient relics category. Which previously is a pre-historic worships place, or pre-hindu of simple megalithic tradition. In form of several small Menhir, with stone composition structures and statues which has characteristic from megalithic era, until now still function as sacred place used by local community to invoke the safety, natural strength and ancestral spirits. In addition, there was also the evidence of historical era when the influence of widespread Hinduism throughout Bali, such as: sculpture "Lingga Yoni', statue "Durga Mahisasura Mardhini" and statue "Ganesha" who sits on two dragons. Interesting part of this Ganesha statue is showing "Candra Sengkala", the symbolic meaning of year Caka 1286 or 1364 AD. While the existence of Alas Kedaton temple based on inscription "Sading's Village" be explained that this sacred area built by one of hindu holy priest, named: "Mpu Kuturan / Mpu Rajakretha" during the reign of "King Sri Masula - Masuli" which began in the year Saka 1172 (1250 AD ), who ruled Bali island for 77 years and ended in the year Saka 1177 or 1255 AD. Meanwhile, according to inscription "Usana Bali" also be explained about the status or function of Alas Kedaton temple as "Penyungsungan Jagat" (a holy place to pray for all Hindus society in Bali island and surrounding areas). Pura Alas Kedaton very different and unique compared to other hindu holy places that found in Bali, because this sacred region has four (4) gates entrance "Pemedal" based on wind direction, and the inner yard (holiest part) is lower than middle yard. Other uniqueness also visible during "Piodalan" (Temple Festival) which is conducted regularly every 210 days (6 months) held during the day and must be finished before sunset. Most unique thing is, during the ceremony not use "Incense", "Kwangen", "Penjor" (Bamboo's pole with coconut leaf decorations) and also not held a "Tabuh Rah" (cockfighting ritual). The most interesting is the completeness ceremony only using "Ceniga" that made from banana's leaves "Mas" whereas in other sacred places in Bali, Ceniga made of "Janur" (coconut leafs). In addition, Alas Kedaton temple location stand up right in the middle of tropical rain forest and inhabited by hundreds of monkeys, which is a Bali native primates. All macacas that found here are highly respected by local Balinese people, also protected by the law from government of Bali. Besides, related to the hindu community belief regarding all apes that existed almost in all tropical jungle on the island of Bali are also classified into one of the "Holy animal" in addition to other sacred animals found, such as: Cows, Geese and others. All monkeys which found in Alas Kedaton temple included into local primates with long-tailed, or in Latin often called "Macacas Fascicularis", with an average weight of young male monkey about 8 kilograms until 10 kilograms, while the female monkey around 4 kilograms till 8 kilograms, and baby monkey's weight around 350 kilograms with black fur on the head. Also powered by the hindu community's belief, particular about the existence of these monkeys are closely associated with the story of hindu epic, namely: "Ramayana", which tells about the existence of monkey's troop who helped mission of "Sri Rama" (Incarnation of god Vishnu) to seize "Sita" who was be kidnapped by "Ravana" (King Alengkapura). Ramayana story is a historical legend generally which tells duality eternal life in between good and bad of human nature, also according to historical research that Ramayana story had happened in the era of "Treta Yuga", which occurred more than 1.750.000 years ago. Ramayana story also tells about the construction of a long bridge, named "Situbanda", (a unique bridge shaped of "curve"), Which now better known as "Palk Strait" existed in between India (Ramesvaram) and Sri Lanka. The bridge made of "Pumice stone" with a bridge length about 323 miles (600 Kilometers) which made by monkey's troop under strict supervision of Sri Rama himself. Lingga Yoni's statue which is basically symbol of "Shiva" in form manifestation of "Tri Murti", ie: Brahma, Vishnu and Shiva. Durga Mahisasura Mardhani's sculpture, with 8 arms and standing on an ox, with wearing a breast cover and lancingan (kancut). In Hindu community belief this sculpture is a form of "Durga" (Energy) while "Shiva" (Power), wherein each of arm (hand) brings; "Camara", "Sara", "Pisau Besar & holding the ox tail", Kadga", Busur Panah", "Trisula" and "Gada". Ganesha statue which sits on lotus flower and two dragons, while his right hand holds "Tasbih" and left hand holds an "Axe" and trunk with broken tusks (ekadanta). In Hindu mythology, Ganesha is son of Lord Shiva and Ganesha also symbol god of wisdom, glory in knowledge, and Ganesha famous has seven names from his power. In addition to the presence of monkeys, there are also dozens of big bat (vampire bat) hanging on the branches of trees. In Alas Kedaton tropical forest there are more than 25 types of trees, and this area is also protected by "Desa Pekraman" (small village community). Until now the existence of monkey forest temple Alas Kedaton frequented by large number of tourists: both from local tourists, domestic and foreign tourists from all over the world when enjoy Bali holiday packages, or when they do half day tour to Tanah Lot sea temple and Taman Ayun Mengwi royal temple surely will stop at Alas Kedaton temple. While the price of entrance fee ticket will be charged at IDR. 20,000 rates quoted per person and must be paid at the front gate before heading to Alas Kedaton temple. 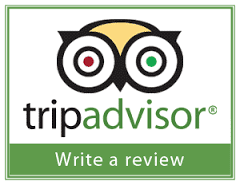 For further explanation and how to organize travel trip to Alas Kedaton temple, please "Contact Us" at Sorga Bali Tours (Online organizer for holidays, Adventure Tour packages and service activities).